Alex Fraim (*1977 in San Francisco, California) has been interested in wholistic health and healing since a young age. After graduating from the University of California, Santa Cruz with a B.A. in Fine Art in 2000 he actively pursued his passion for Yoga, martial arts, nutrition and alternative health while working as a graphic designer. These interests gradually morphed from passionate hobbies into a full-time profession, and he proceeded to complete a 2-year Yoga teacher training program at the Iyengar Yoga Institute of San Francisco, followed by a 2-year Clinical Ayurvedic Specialist program at the California College of Ayurveda. While living in San Francisco (until 2009) he ran his own Ayurvedic consulting practice and actively taught Yoga group classes and private lessons. Since 2009 he resides in Waldkirch (near Freiburg), Germany, where he currently runs the Institute for Yoga and Ayurveda of the Black Forest, which offers classes, consultations, therapeutic treatments, trainings and workshops. 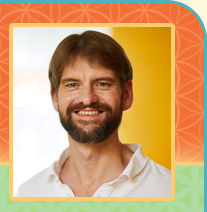 In 2014 he completed a 2-year training program in Neural Somatic Integration, a unique approach to healing trauma with its roots in the Esalen Institute, and continues to further his knowledge and expand his offerings by participating in training programs in the fields of Yoga, body work and other healing modalities. Interested in Indian (and western) philosophy from a young age, the primary emphasis in his practice has been on utilizing the therapeutic power of Yoga and Ayurveda, which are sister sciences and complement each other very effectively. He has visited and resided in India three times, where he had the opportunity to deeper his studies of Yoga and Ayurveda. Additionally, he has extensive knowledge of nutritional supplements and herbs (both western and Ayurvedic) and stays up to date with the newest discoveries in nutritional science and disease prevention/treatment through nutrition. He has experience with a variety of healing modalities in addition to Yoga/Ayurveda and he integrates these into his clients' treatment plans when necessary. Lately he has been particularly working to expand his knowledge of Jyotish (Vedic/Indian Astrology), which he also incorporates into his clients' treatment considerations. In his consulting practice his focus is on creating a treatment program which addresses the physical, emotional and spiritual levels of the individual, with the goal of creating optimal balance and helping his clients to reach their full human potential. He brings a wealth of experience with many varying healing modalities and it is his strong belief that a combination of Ayurveda, Yoga and modern discoveries from the cutting edge of nutrional science can lead to optimal physical, mental and spiritual health and well-being. He finds great joy in being able to serve all who come to him. This Web site was created with the intention of being able to serve the English-speaking population who do not live in the vicinity of his practice by offering consulation services online.